State Grange posts NET GAIN! We have said all year long, all we have to do is secure 1 member at a time. Simple math tells us 1 and 1 is 2. Not this time, 1 plus 1 is 11. Congratulations, we had a net gain of 11 for the quarter ending 6/30/11. Your hard work is paying off, this is the first quarter in quite some time we have seen a net gain and we should rejoice in all your efforts in strengthening your Grange. We believe this is only the tip of the iceberg in membership growth. There is a renewed energy and level of excitement in each Grange. Continue to build on this, be more visible in your community, tell EVERYONE about the YOUR Grange and above all else, continue to ask them to join the Grange. • Put cards on the tables for guests to join a mailing list, events newsletter, Facebook, etc. include an area for them to request additional information about your grange. Make these cards part of a free drawing. • Place mats: Take an 8.5” X 14” sheet of paper and design an events place mat for each table setting. Include upcoming events and contact information. • Put a bulletin board in your hall listing current events and recent news. KEEP IT CURRENT! • Put flyers and brochures in your town hall and public libraries. KEEP THEM CURRENT! 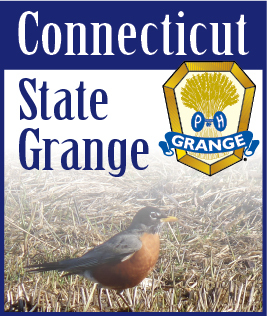 • Hang Posters advertising your Grange and events at town hot spots, again, KEEP THEM CURRENT! We belong to the Grange at one of the most exciting times, we have the opportunity to chart the course for a stronger, more visible Grange in our community, it can be done, and you know how we know that? You are doing it! A net gain of 11, CONGRATULATIONS!